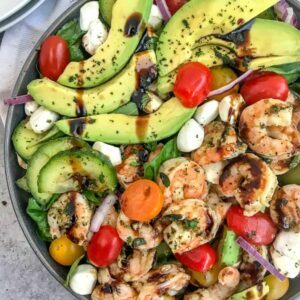 Loaded Avocado Caprese Salad with Shrimp is a super simple, light and refreshing salad bursting with so much flavor. 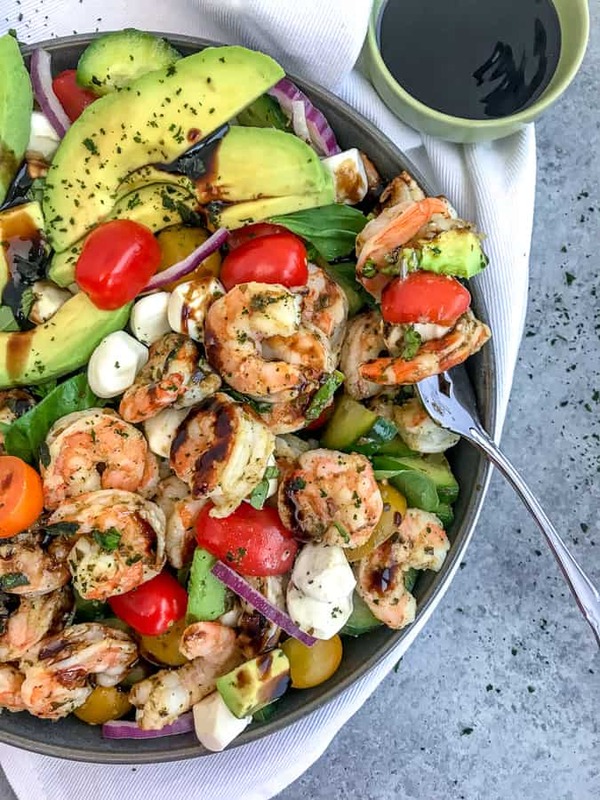 This summer-feeling salad is loaded with fresh mozzarella, cherry tomatoes, cucumbers, red onion, and sliced avocado – all tossed in basil pesto and a sweet balsamic glaze. 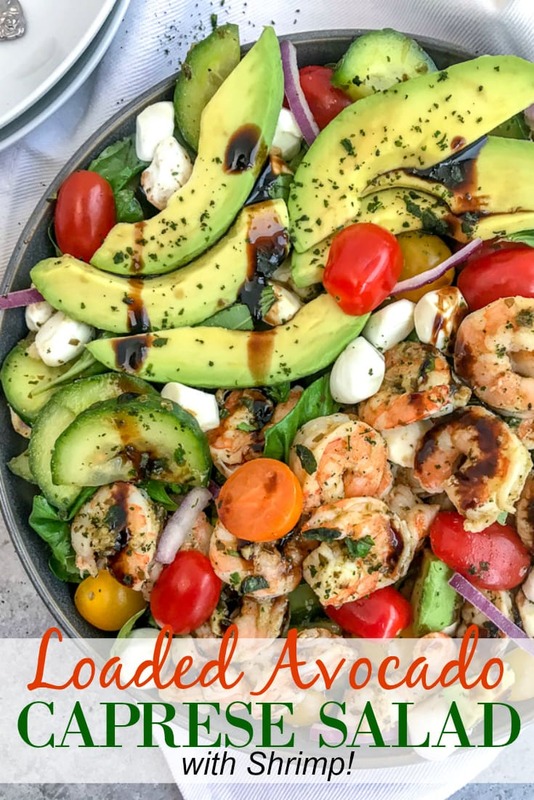 The avocado slices add an extra boost of creamy flavor and the pesto-balsamic glaze gives this salad the tangy flavor that your taste buds will absolutely adore. 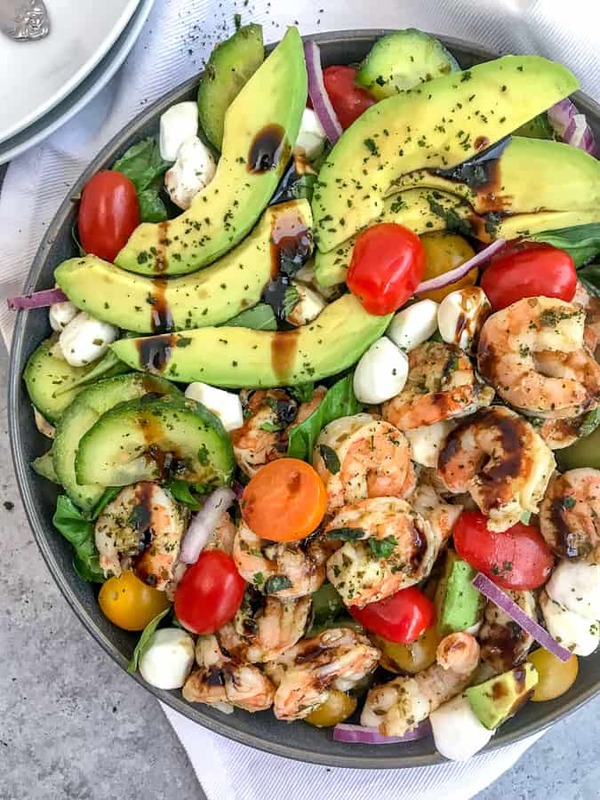 That is exactly what this salad is – summer in a bowl. 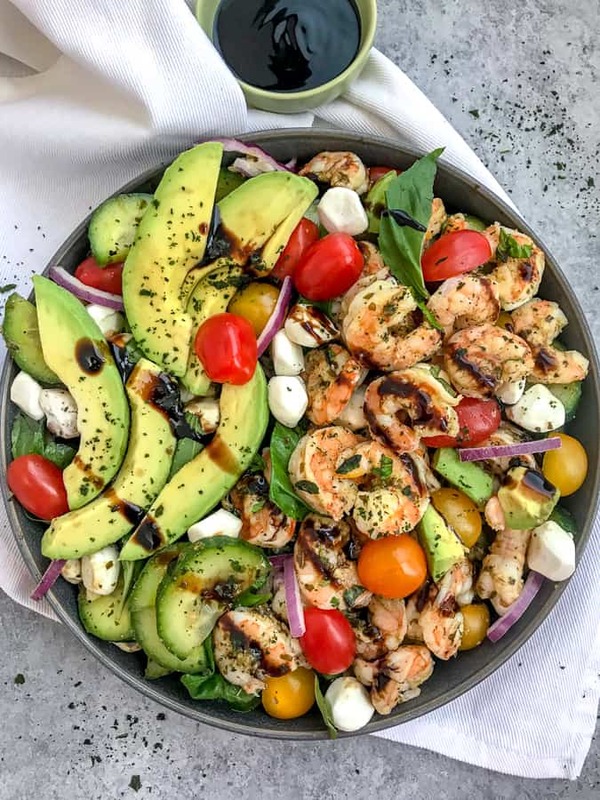 This Loaded Avocado Caprese Salad reminds me that summer will be here before I know it and I will soon be basking in the warm sunshine. I think recipes like this are essential in helping us get through these cold, dreary months. It’s like a placebo effect – tricking first our taste buds and then our minds that summer will be back. No? It’s either that or closing our eyes and picturing ourselves with our toes buried in the sand and a frozen margarita sweating with condensation in our hand. Either sounds nice right about now! What I love most about a salad is its versatility. They are much like soup where you can swap out this for that or add a smorgasbord of ingredients and it will still turn out incredibly delicious. I like to think that way about this salad. I think avocados pair well with just about anything and I feel the same way about that sweet, tangy balsamic glaze. So when they come together to be paired with fresh mozzarella, basil, and tomatoes? Holy heaven in a bowl!! But never fear. If you don’t have a few of the ingredients listed, here are some delicious swaps or add-in’s if you have them on hand. 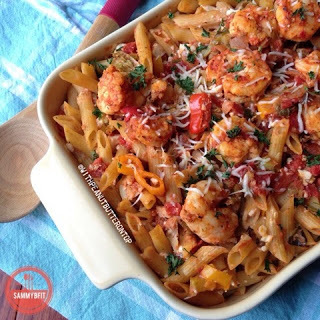 Shrimp: Don’t have or not a fan of shrimp? Swap it out with cooked/rotisserie chicken. Promise it will still be incredible. I would even recommend crab meat, as well. Cucumber: You can swap this out with zucchini or yellow squash. Fresh mozzarella: Don’t have it on hand or can’t find it? You can also use burrata cheese. I have also tried this combination with goat cheese and it is phenomenal. Add-in ideas: Cooked sweet potato or butternut squash, cooked pasta or quinoa, or layer this on a bed of romaine and arugula. Whatever strikes your taste bud fancy! Get creative with what you have in the kitchen and see where your creative little taste buds take you. You may be pleasantly surprised! I generally always am. When making this salad, I highly recommend using fresh mozzarella cheese. You can buy it as a ball or in pearls. Either will work. Just make sure that it is fresh. There is an undeniable creaminess to it that just melts in your mouth. The flavor is much more profound than with shredded mozzarella or a block. A world of difference between the two, I promise you. Use fresh basil, please! Grab a small 5 ounce package of basil leaves and add it to this recipe. I cannot stress fresh enough in this recipe. Dried basil simply will not do. Please don’t offend me or even your taste buds by using dried! A light, refreshing salad that is perfect for any occasion. 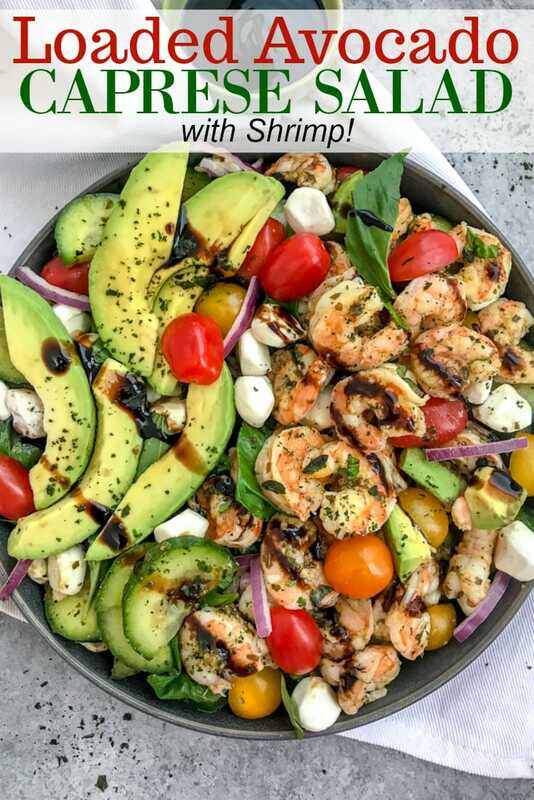 Loaded with fresh mozzarella, basil leaves, avocado slices, cherry tomatoes, cucumbers and tender shrimp - all tossed in a sweet balsamic glaze. Place a large, nonstick pan over medium heat with olive oil. Once the olive oil has heated, add the shrimp and season with salt, pepper, and garlic powder. Squeeze 1 tablespoon of fresh lemon juice over the top. Cook 1-2 minutes per side and flip, cooking an additional 1-2 minutes or until cooked through and pink. Remove from burner and toss with 1 tablespoon of basil pesto. Allow to cool to room temperature and then place in the fridge to cool even further while you prepare the salad. *SEE NOTES BELOW. To a large salad bowl combine tomatoes, mozzarella pearls, cucumber, red onion, and basil. Combine the ingredients for the dressing in a small mixing bowl and pour over the salad. Add in the cooked shrimp and gently toss to coat. Taste test and add more salt and pepper, as needed. Drizzle with extra balsamic glaze and a fresh squeeze of lemon juice (both optional, but delicious in my opinion). Garnish with avocado and freshly chopped basil leaves. Combine 1/4 cup balsamic vinegar with 1 1/2 tablespoons of light brown sugar, maple syrup or honey in a small saucepan over medium heat. Once it begins to bubble, reduce the heat to medium-low and allow it to simmer 8-10 minutes, or until it has reduced in volume by half. Remove and allow to cool before using. Shrimp: I prefer the shrimp to be cooled, but this is entirely up to you. 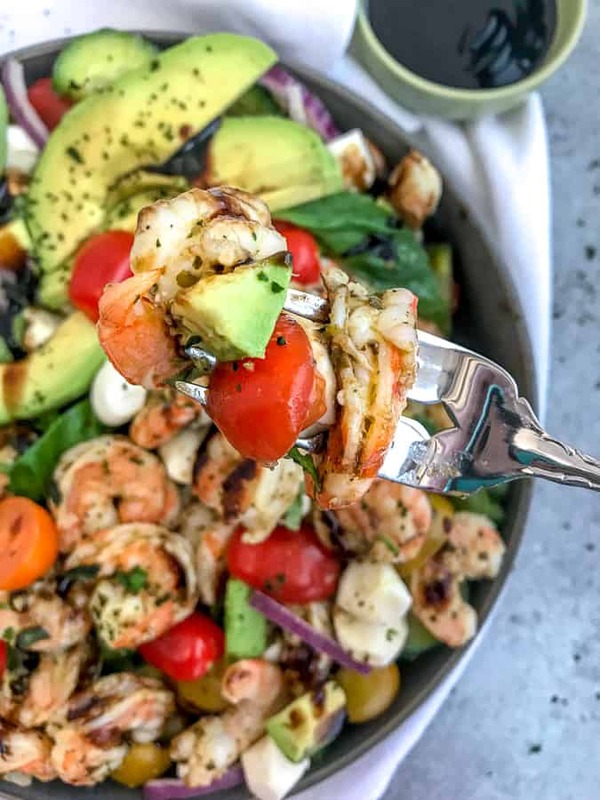 This salad can be served with warm or cooled shrimp. I like to add half of the avocado to the salad and gently toss it in and then garnish with a little more. Avocado is best when cut fresh, so add to the salad right before serving.